See more objects with the tag symmetry, multicolored, designers, ornamental, tool, stylized, color choice, analogous color. See more objects with the color darkgrey black slategrey saddlebrown darkslategrey or see all the colors for this object. This is a Sample plate. It was manufactured by Joseph P. Emery. It is dated 1899 and we acquired it in 2003. Its medium is glazed porcelain. It is a part of the Product Design and Decorative Arts department. 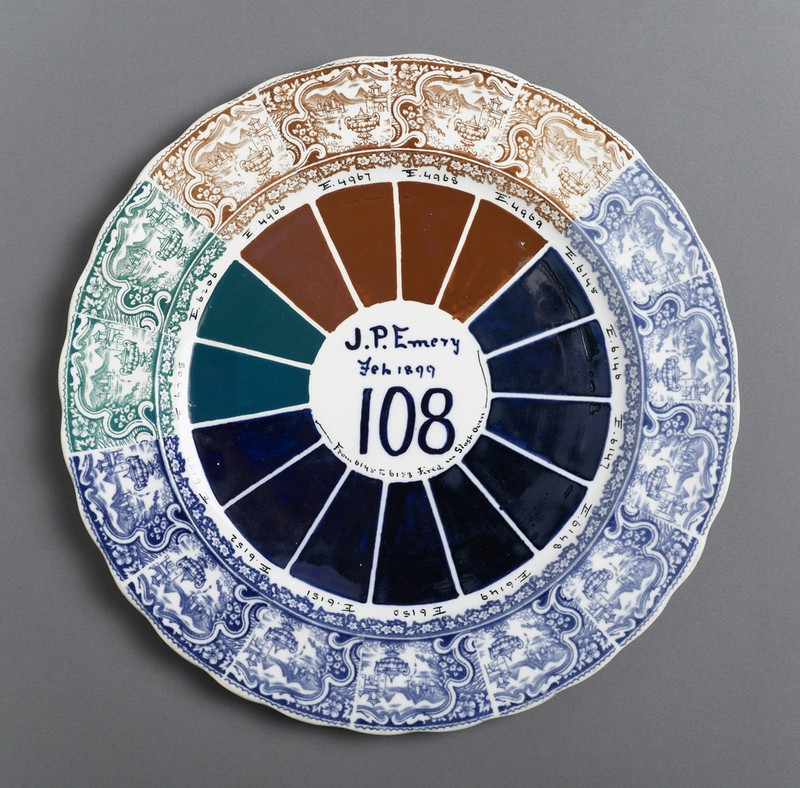 This plate displays glazes in various colors produced by the Joseph P. Emery Company, a manufacturer of colors for the English ceramics industry in the 19th century. 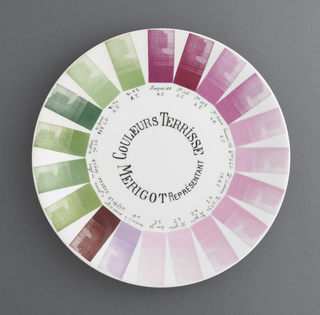 The plate serves as an example of one method by which Emery could display a range of colors to prospective clients. 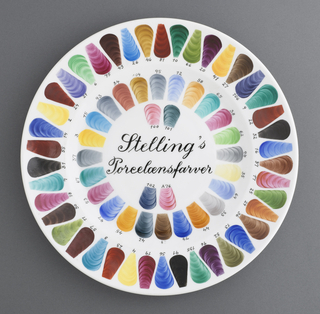 The wedge-shaped color fields and decorative scene repeated around the rim, with corresponding code numbers, were a sampling tool enabling Emery to better market its colors to local potteries in the Staffordshire area, a long-standing ceramics center in England. 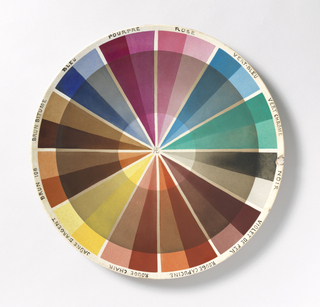 This example could also have served as a test plate, to evaluate the qualities and characteristics of Emery colors in the manufacturing process. This plate is an example of the “sampling” format. 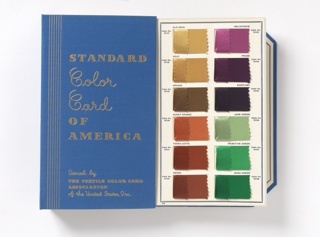 This format was widely used by manufacturers to assist consumers in choosing the right combination of color, design, and materials, for products ranging from textiles to dinner plates. These products have become stylistic indicators of the time in terms of the choices of color and design. They also are beautiful artifacts in the arrangement of visual information on either the page of a sample book or the rim of a plate. 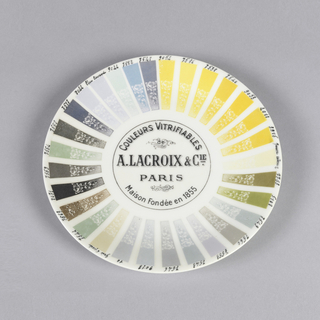 Sample plates are relatively rare and greatly enrich the museum’s documentary holdings related to ceramics design, technology, and marketing. This object was purchased from Marion Harris. 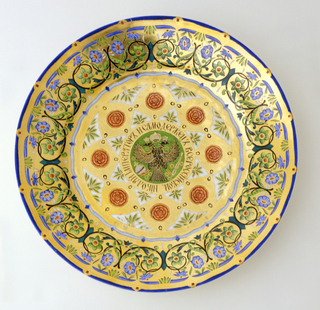 It is credited Museum purchase from Charles E. Sampson Memorial Fund. Painted in blue glaze in center well of plate: "J.P.Emery" / "Feb. 1899" / "108"; "From 6145 To 6153 Fired in Slosh [Glosh?] Oven."